Pressure sores—including both pressure ulcers and bed sores—comprise a substantial obstacle within nursing homes, hospitals, home health, and other settings wherein health services are rendered. Primarily caused due to the reduced blood flow to an area of the body as a result of constant pressure thereupon, the resulting damage can lead to dead tissues as well as open wounds. Research shows that in excess of four (4) million individuals develop pressure sores annually—the majority of who are elderly and geriatric patients. Naturally, pressure sores often serve to further aggravate a patient’s condition by extending recovery timeframes and causing added complexity to the effective apportionment of patient care. The Agency for Healthcare Research and Quality’s (AHRQ) clinical guidelines for prevention and treatment of pressure sores, Pressure Ulcers in Adults: Prediction and Prevention, and Pressure Ulcer Treatment, provides a user-friendly guide for quick reference in day-to-day practice. In the guide, the AHRQ provides key steps in preventing pressure ulcers, and suggests that prevention itself is the best treatment. reducing the incidence of pressure ulcers through educational programs. 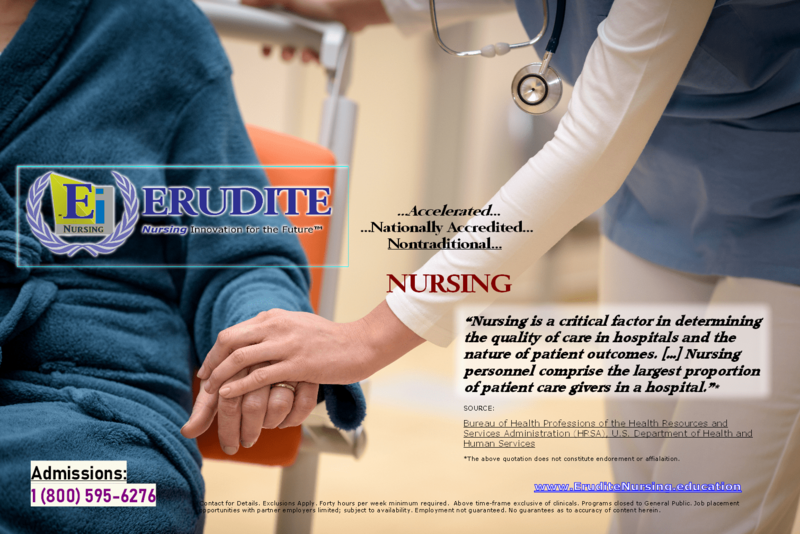 Erudite Nursing Institute™ takes the recommendations of the Agency for Health Care Policy and Research (AHCPR)—and all national standards—seriously; and, actively works to integrate the most up-to-date information into the accelerated nursing program curriculums, pursuant national accreditation standards. It is one of the many aspirational goals of Erudite Nursing Institute™, that program graduates—after having successfully obtained their Board licesure and credentials—proceed into the Nursing workforce and skillfully demonstrate their unique ability to contribute to the improvement of patient care for Americans by helping reduce pressure sore risk in accordance with national recommendations and standards. demographic characteristics, diagnoses, and prescription of preventive interventions. Journal of the American Geriatrics Society. 1996; 44(1): 22-30. Institute of Medicine (US) Committee on the Adequacy of Nursing Staff in Hospitals and Nursing Homes; Wunderlich GS, Sloan F, Davis CK, editors. Washington (DC): National Academies Press (US); 1996. Panel for the Prediction and Prevention of Pressure Ulcers in Adults. Pressure Ulcers in Adults: Prediction and Prevention, Clinical Practice Guideline, Number 3. AHCPR Publication No. 92-0047. Rockville, MD: Agency for Health Care Policy and Research, Public Health Service, U.S. Department of Health and Human Services. May 1992.